Permaculture & Bioremediation to Clean up Oil Spills! 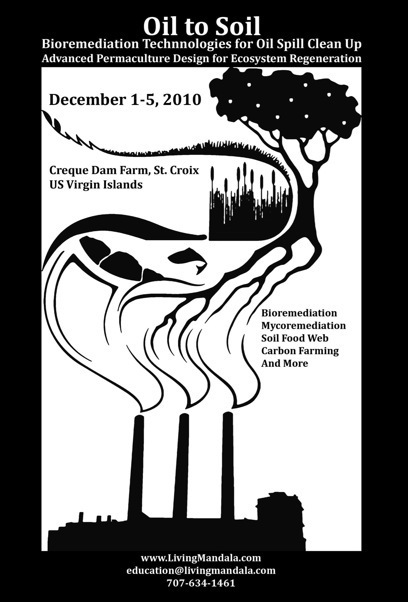 Though this course may be outside your bioregion… given recent events, challenges, and opportunities around the issue of Oil… we wanted to spread the word about this unique course on Advanced Permaculture & Bioremediation Technologies for Oil Spill Clean up this December in a beautiful location in the U.S. Virgin Islands. At a time of global climate change, depletion of resources, pollution of water, decline of the ocean’s fisheries, huge losses of top soil, and widespread destruction and contamination of vital ecosystems worldwide… there has never been a more important time to learn and implement cutting-edge technologies for bioremediation and ecosystem restoration. Oil is one of the primary contaminants which continues to inflict great damage on ecosystems across the planet. The devastation from oil is visibly evident through disasters like the recent BP Oil Spill in the Gulf of Mexico – but the environmental consequences of such a disaster may be so tremendous and far reaching that it may take several decades to realize the full implications it will have on the plant and on ourselves. The manufacturing and use of oil is also a primary contributor to carbon emissions in the atmosphere. At a time of global climate change, depletion of resources, pollution of water, decline of the ocean’s fisheries, huge losses of top soil, and widespread destruction and contamination of vital ecosystems worldwide… there has never been a more important time to learn and implement cutting-edge technologies for bioremediation and ecosystem restoration. This course will concentrate on learning & applying whole systems design to remediate toxic spills combining three of the most promising techniques for remediating spills and building soil: bioremediation, mycoremediation, and carbon farming. During the course we will learn the processes, functions, and the application of these appropriate technologies in the context of permaculture design and hands-on experience, with a focus on designing integrative solutions and applying them to actual oil spill sites on St. Croix. This course is a part of a long term initiative to re-mediate spills; to push the oil industry, government, and private sectors towards more ecological practices, to educate & shift consumer relationships, and to create new jobs in bioremediation and ecosystems restoration. This course will be integrating with broader bioremediation and climate change mitigation campaigns with our partners WeForest, Re:Char, Gaia University, Virgin Islands Sustainable Farm Institute, and others. Deliver low-cost, cutting-edge, oil spill remediation techniques & technologies. Develop scalable, economically viable remediation models that can be implemented by consultant teams, clean-up teams, and the oil industry. Create an open source, low cost toolkit for citizen lead bioremediation efforts. Generate profits and attract investments to continue to re-invest in the strategic implementation of these bioremediation technologies on larger and larger scales. Register before the Early Bird Deadline on November 5th to receive $150 off tuition. $250 off tuition for Permaculture Design Certification Course Gradutes! To Register for the Promotional Discount Click Here. Help us spread the word about this important course and green business opportunity; and in turn, we will help to support your work in the world by offerring $125 (or credit towards acourse) for each person who signs up and pays for a class through your customized affiliate link. To participate, click the link below. Thank you for helping to strengthen our network and further empower regenerative educational initiatives on the planet. 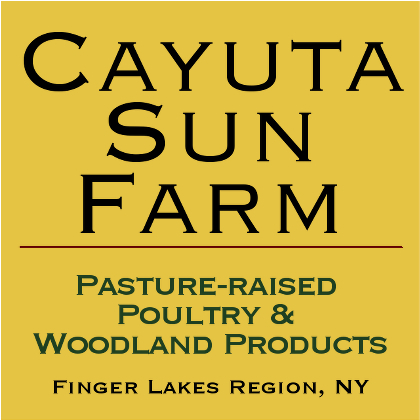 ← Conference: Ripening the Food Movement, Oct 15-16, 2010 Pace Univ.